This page outlines how the whole concept of acts of KINDNESS came about. As will be made clear in our story, we did not create "random acts of kindness" nor did any other currently living individual. Our contribution was to bring massive media attention to what has been around for many centuries but seems now and then to be forgotten or ignored. The story is brief but does point out how one person can make a difference even when that was not the objective. Below is our story for your consideration. "Today, I will commit one random act of senseless KINDNESS -Will You?" The year was 1993 and my classes in the Business Department at Bakersfield College were going along quite well, except, I was getting a bit bored with my outside assignments. Something different was called for immediately. A morning radio newscaster gave me the break I was looking for when he announced another random act of senseless violence. That was one violence more than I could take, so without further thought I merely plucked the word "violence" out of that well-known negative phrase and inserted the word "kindness," and without my knowing it an international movement was launched. The outside assignment for my Human Relations students was to go out into our community and "commit one random act of senseless kindness," write up your kind act and analyze your experience as well as that of the recipient. What made this assignment so successful was the sincere personal interest shown by the students. Their acts of kindness and written and verbal experiences brought this idea to life. Fifteen years later the idea continues to grow and now has a life of its own. From a single web site in 1993 to dozens if not hundreds today the idea of committing acts of kindness has become part of our culture. When I spoke at the request of the Prime Minister of Singapore a few years ago, I was informed that some 12 nations had adopted the concept of kindness as part of their humanitarian program. I have given hundreds of speeches all over our nation and some 350 radio and television interviews to say nothing of the hundreds of newspaper and magazine articles that have been generated. Many of these historical records are now housed in our Bakersfield College Archives in a manner far more sophisticated than anything I could ever have dreamed of developing. As new books, articles and interviews arrive; they are skillfully added to the growing collection including the actual Olympic Torch I carried as it made its way to the 2002 Olympics in Salt Lake City, Utah. Today, in addition to continuing motivational speaking, I am concentrating my efforts on creating kindness clubs in our local high schools. We now have four very successful clubs at Bakersfield High School, Stockdale, East, and Frontier. I expect several more to be added in the coming academic year. This has been quite a ride and I still enjoy every minute of it because there are no negative down sides to kindness. As the years go by, and the concept of kindness continues to expand, it will not be long until its origins will be lost to history. When that happens I know I did something useful that will live long after me. Such a future is what I wish. We've all heard stories and read headlines about the plague of senseless violence. It seems to be an inevitable fact of life. Well, in 1993, Dr. Chuck Wall decided to do something about it in the form of an assignment presented to his college class: Go out and commit a "random act of senseless kindness" and write about your experience. 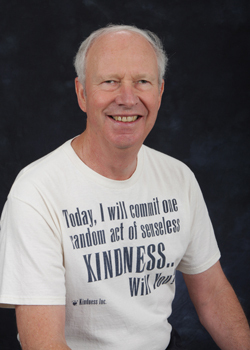 Today, Dr. Wall's inspiring lesson has blossomed into a worldwide Kindness movement. Fueled by tremendous media attention, including Dr. Wall's appearances on The Oprah Winfrey Show and The Crusaders, stories of generosity and the awakening of the human spirit continue to pour in from across the country and around the world. And the momentum generated by random acts of senseless kindness led to the establishment of Kindness, Inc., a non-profit organization staffed entirely by volunteers. An act that positively influences the life of both the giver and the receiver is a kindness. It doesn't have to cost money or be difficult to perform. It can be spontaneous (random) or premeditated. It can be as simple as a smile or a thank you, and as complicated as starting a non-profit organization to benefit those in need. Kindness has four working parts: dignity, respect, compassion, and humility, If you have all of these things for yourself, then you will be able to share them with others. If we reach out with dignity, respect, compassion, and humility, we are likely to feel it being returned. Actively seeking out opportunities to assist others will naturally bring a certain amount of warmth and feeling of self-worth to each of us. It feels good to help others and others feel good knowing someone wants them to help. "Considerate" and "helpful" are words often used to describe a kind deed. Kindness is what you define it as, rather than what someone else thinks you should believe it is. I suggest all people actively attempt to live by my phrase, "Today I will commit one random act of senseless kindness. Will You?"